Josh Randall (Norris) is a soft-spoken tough guy who’s used to being an enforcer. But he really gets in over his head when he travels to Hong Kong. Working for the boss of a popular casino, Randall notices something dangerous is afoot when heavies want to buy the casino but the management refuses. People start dying all around him, so he and his old ‘Nam buddy LeRoy Nicely (Minor) try to fight off the baddies while protecting the casino owner’s daughter. Evil gangster boss Stan Raimondi (Cavanaugh) is greedy and wants not just the casino money, but Randall’s blood. Meanwhile, Inspector Keck (Shaw) is trying to use his side of the law to figure out what’s going on. Will Josh and LeRoy get answers? Will they get justice? Find out today! 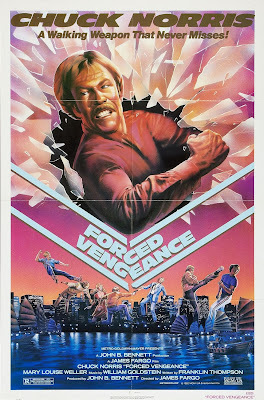 Forced Vengeance is classic 80’s Chuck. It was still when he had blonde hair and a blonde mustache. It seems Chuck movies can be broken up into two eras: blonde Chuck and red-head Chuck. At some point in time his hair turned a rusty, russet color, thus dividing his career into two halves. Not that one is better than the other, necessarily, but it makes his movies easily identifiable. This particular outing takes a while with its setup, and the pacing isn’t necessarily break-neck, but is solid and reliable. It’s like an old tank that just keeps rollin’ along at its own pace. You get your rewards, but it’s not instant gratification like the kids are used to today with their MTV and their e-lectronic gizmos. Even though Golan and Globus had nothing to do with it, this whole film has a look and feel that is very Cannon-esque. 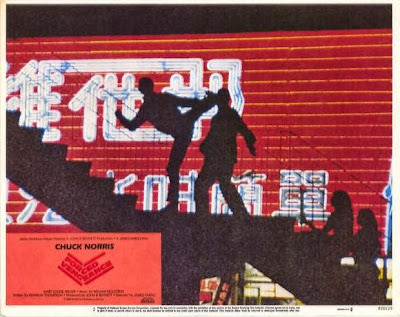 From the opening slow-motion, silhouetted fight in front of the neon (much like the opening of one of Sho’s classic Cannons) to the way the rest of the film is shot, it will certainly put you in that Cannon frame of mind. 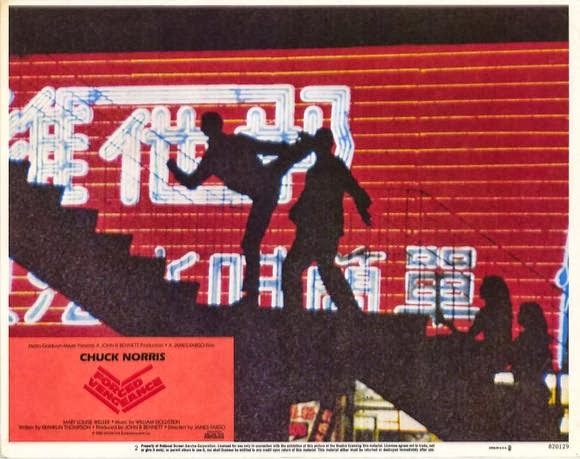 The movie uses its Hong Kong locations to very nice effect, and the music by William Goldstein is so sweeping and dramatic, it helps the film rise to heights it might not necessarily have reached otherwise. The main theme is especially cool. Another soundtrack observation: there is an excellent disco/muzak theme of “Super Freak” which is a lot of fun as well. Chuck, who gets some suave line readings and wears tuxedos in this one, gets to channel his inner James Bond. Can you imagine him as an official Bond? We can only dream. Fan favorite Richard Norton is here too, but in a “Where’s Waldo”-esque cameo that defies you to spot him. Here’s a hint: with his blonde bowl haircut and matching mustache, he looks like he just stepped off the set doing stunt work for Chuck. (Indeed he did do stunt work on the film, along with John Barrett and Aaron Norris, among others). And he appears almost naked, wearing only a pair of tiny red shorts. Still and all, this movie could have used more Norton. The massive red flower Raimondi wears on his lapel is almost the same size as Norton’s shorts. Coincidence? Or a visual motif? In other wardrobe news, Chuck’s wide array of cowboy hats not only is impressive, but they almost become secondary characters in the movie, as at one point Chuck woefully decries “Why do they always pick on my hat?” Truly the eternal question. When Forced Vengeance was originally released on VHS, it came in one of those awesome MGM silver big-boxes. The kind with the cover on a hinge and the cassette in a plastic tray. We love those. Now the film is on DVD of course, but for the coolness factor, you have to love the original packaging. So for some classic kicking and punching Chuck style, Forced Vengeance is a prime example of why everyone finds him so endearing. Also check out write-ups by our buddies, Cool Target and The Video Vacuum! You are absolutely right, this is classic WoodChuck. The Finnish VHS version was imported from Sweden and cut by over 10 minutes. I think even the titles were cut, apparently the silhouette kicks were too violent. My experience with Chuck is limited, but I had still much fun with this one. Roger: That is really interesting about the Swedish cuts. Thanks for the info! M: Thanks! This was a very decent Chuck outing.